So, while I was researching this article, I realized one thing. I apparently have not been to a lot of character meals myself. Of course, I've been to a few, but really, in the grand scheme of things, character meals are just something I've not done a whole lot of. Part of this, I'm sure has to do with the fact that I don't have kids. Of course, that really isn't a great excuse because I mean, I am a big kid at heart. Part of it also could have to deal with the money aspect. These character meals are EXPENSIVE! I think the majority of the time I've been to them, it's either been for breakfast or it's been because I was on free dining and the cost was relatively justified. Paying out of pocket for dinner is quite a chunk of change! If you plan on eating at a lot of character meals during your vacation and you're staying on Disney property, you really should consider looking into the Disney Dining Plan. If you do the math, being on the plan in this instance could save you money. Chef Mickey's: This is my number one choice for sentimental reasons, seeing as how I got engaged here. This restaurant is found at the Contemporary Resort and is available for breakfast and dinner. It is a restaurant that features the Main Cheese himself, one of the few places that actually do so. Other characters typically include Minnie, Donald, Goofy, and Pluto. The meal here is served in buffet style. This place is a lot of fun, but can be loud. Be prepared to wave your napkins in the air, like you just don't care! 1900 Park Fare: I've been here for dinner to visit Cinderella, the Evil Stepmother and her Evil Stepsisters. That part was fun. What was not fun...unfortunately, the food didn't impress me. This was one meal I was glad I didn't pay for. (I was on free dining at the time.) They do have one special menu item that I did find delicious and that was the Strawberry Soup. Sounds gross, but it's really good. The restaurant, found at the Grand Floridian, also features a character breakfast called the Supercalifragilstic Breakfast. It features characters like Mary Poppins and Alice in Wonderland, plus a few additional surprises. Both meals are served as buffets. The restaurant is very regal, much like the Grand Floridian is. `Ohana: The restaurant features a special character breakfast called `Ohana’s Best Friends Breakfast. This family style meal (served where bowls of food are brought to the table and doled out amongst everyone dining. You can ask for more, if you run out.) takes place at the Polynesian and features Lilo and Stitch. Mickey and Pluto have also been known to appear! Some tables here feature a great view of Cinderella Castle. The restaurant has a great tropical flair to it and the food is pretty good too. Crystal Palace: This meal features an experience to dine with Pooh and his 100 Acre Woods friends. Guests will find Tigger, Piglet, and Eeyore as their other dining companions. This restaurant features meals for breakfast, lunch, and dinner. The building is very grand and is themed around an atrium experience. If you would like to get into the Magic Kingdom before it opens to guests, booking a meal here early in the morning is a surefire way to get to experiencing the park with no crowds. Tusker House: This restaurant features Donald's Safari Breakfast and Lunch. This is another restaurant where you'll get to dine with Mickey and a few of his friends. (Of course, Donald will be there, along with Daisy and Goofy.) This buffet found in the Africa section of Disney's Animal Kingdom features both American dishes and some with African inspiration. Don't worry, it's nothing too crazy and exotic! Cape May Cafe: This restaurant offers a character meal for breakfast called the Beach Club Buffet. Diners will get to experience meeting characters dressed in their beach wear. Characters usually include Minnie, Goofy, Donald and Chip and Dale. The restaurant continues the traditional seaside experience you get when you visit the Beach Club. There are four additional options...though these are ones that are not so high on the priority list. Cinderella's Royal Table: I know this is like heresy, but Cindy's is not high on my list. This restaurant found in Cinderella Castle, features the ability to dine with Cinderella and her friends during breakfast, lunch, and dinner. This is certainly an expensive meal and you are mostly paying for atmosphere, because the food here is pretty lackluster. Breakfast is pre-plated, however, lunch is a la carte. I would suggest going to this restaurant if you have a little princess or really want to dine in the castle. Otherwise, I think there are better options for less money. Akershus Royal Banquet Hall: This is one of those better options for the money. You get to experience more princesses, it seems, with guests getting to dine with most of their storybook favorites. This restaurant, found in the Norway Pavilion at Epcot, features a buffet with Norwegian influences. Don't fear, normal items can be found on the menu too, for those who are pickier eaters. Breakfast is buffet style. Lunch and Dinner are a la carte. Garden Grill: Over at this restaurant in the Land Pavilion at Epcot, guests get to have dinner with Chip and Dale at the Harvest Feast. Other characters that appear are Mickey and Pluto. This meal is served family style and allows guests to refill any dishes that go empty. One of the coolest aspects of this restaurant is that as you dine, the restaurant rotates, allowing guests to get to peek in on scenes of Living With The Land. This meal is only served at dinner. Hollywood and Vine: The Playhouse Junior Play and Dine features characters from Disney Junior, such as Jake from Jake and the Neverland Pirates, Hanny Manny, and two new additions in Sofia the First and Doc McStuffins. Both breakfast and lunch are served buffet style and features quite a good variety of dishes. This is the only place where little ones can dine with their favorite Disney Junior characters on property, so if they are fans, you want to make sure to make a stop here. 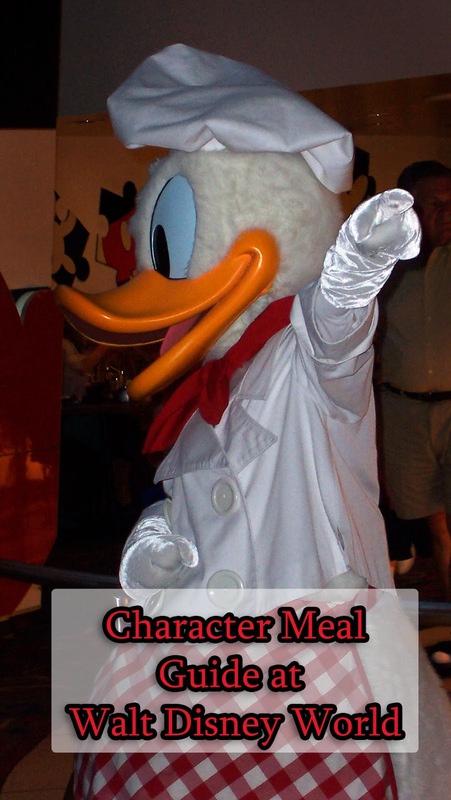 Character meals are great fun and they are a great way to get up close and personal with your favorite character to get an autograph or a photo without having to wait in huge lines in the park. For guests who would like to make Advanced Dining Reservations for any of these restaurants, they can do so online at https://disneyworld.disney.go.com/dining/#/reservations-accepted.